Blockchain.. the buzziest word in the whole tech space in 2016. While from a technological point of view, blockchain is definitely one of the most exciting and ambitious initiatives across all industries, from the business side it’s still at very early stage (so called “prove-of-concept” stage for the whole industry). Despite a lot of noise around blockchain industry, there are not to so many investment deals in this area as it was expected a year ago: blockchain accounts today to only 2% of the whole fintech market. 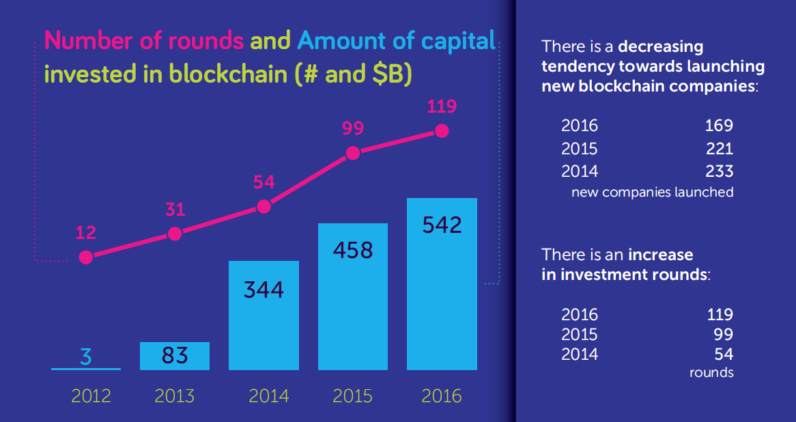 There is a decreasing tendency towards launching new blockchain companies and this number has dropped by 25% in 2016: only 169 new blockchain companies launched in 2016, while in 2015 — 221, and 233 companies were created in 2014. However there is an increase in number of investment deals —20% YoY growth: 54 deals in 2014, 99 – in 2015, 119 – in 2016. Average deal sizes and tickets to equity grew in 2016: companies that reach later stage rounds receive huge equity investments. Regarding exits in blockchain, it’s now too early days to expect many notable acquisitions, however few M&A deals already happened. Mainly, blockchain startups are acquired to get an access to their technology and getting the smart team on board of a big organization, so exit multiples are not so high as if these companies had significant financial and operational traction. US is still the leader in the blockchain market with 40% of the global volume. However Asia, following the fintech trend, started to rapidly grow in the blockchain space as well, apparently mainly driven by Japan, not China yet. One third of global blockchain investments fall into Asia. Payments, trading, remittances and wallets are the largest segments of the blockchain market. The world of blockchain is very fragmented and the abundance of implementation opportunities, the technical complexity of the subject and media hype around the industry greatly diminish one’s ability to separate the wheat from the chaff in any particular case. Let us first talk about cryptocurrencies as the most “high-profile” segment, which is at the same time the least interesting one for the real innovations (and only shareholders benefit from it). There are more than 150 cryptocurrencies in the world, of which there are about 30 “famous” ones, with 10 of those accounting for the lion’s share of transactions. Most of the mining capacity is situated in China, with 60% of mining controlled by four Chinese pools and Georgian-American BitFury being the largest miner outside of China. There are about 50 active exchanges with another 50 recently leaving the market. Nine exchanges are the major ones and the three largest are in China. The most traded currency pair is not BTC/USD, but BTC/RMB (Chinese yuan). China demonstrates a fabulous ability to blow and burst bubbles – take, at the very least, the example of People’s Bank of China, which has started to mop up the online lending market, polluted by numerous fraudulent and (near)bankrupt firms. A speculative topic calls for support by speculative tools: high-frequency trading and trading with leverage are the most actively developing segments, together with derivatives being issued (and second derivatives), and more and more index funds appearing every day. It all looks like Ponzi scheme to an outside observer, the only question is – who is going to win and who is going to pay for it? E-wallets represent a more interesting segment indeed, especially those allowing users to use and keep several different currencies simultaneously and using cryptocurrencies as a universal base unit for accounting purposes, they issue payment cards for clients, enabling people to pay offline and online with the money kept in e-wallets. Examples are Hong Kong Xapo (raised $40 million in another round in 2016, actively expands in Argentina and Venezuela) and British Wires. The adjacent market sector of crypto ATMs looks more like a PR campaign than a real market with slightly more than 1000 ATMs installed in the whole world and manufactured by only three companies. ICO (initial coin offering) is an amusing innovation of the market. It is a mix of IPO (selling of company’s stock but for cryptocurrency instead of “standard” money), crowdfunding (as people buy products and services, which are to become available in the future) and p2b-lending (with lending of company’s cryptocurrency). The total amount raised during ICOs in 2016 is around $250 million. A DAO (Decentralized Autonomous Organization), instantiated on the Ethereum blockchain, was created with an objective to provide a new decentralized business model for organizing both commercial and non-profit enterprises. The DAO (another company involved in tokenization of houses, cars and other property of the participants for subsequent sharing) raised a record-breaking $150 million from 11 thousand of enthusiasts and $50 million of these were “stolen” after hackers exploited some vulnerabilities of the DAO’s underlying code. The most interesting (and perspective) blockchain-related spheres are strictly outside of the cryptocurrencies’ realm – they include solutions for healthcare and logistics industries, land sale support, governmental and corporate workflow solutions. Estonia, a global leader in e-government, has recently launched a unified medical record database, accessible to hospitals and insurance companies, in partnership with the blockchain startup Guardtime. Prescrypt works along the same lines in partnership with SNS Bank and Deloitte in the Netherlands, BitHealth – in the United States. Swedish government together with ChromaWay and a partner bank is going to test blockchain smart contracts for a land registry, which are to simplify the life of buyers, sellers, and banks, using land as a collateral on regular basis. BitFury launches a similar initiative in Georgia, whereas BitLand enters Ghana and Honduras (and have plans to expand to Nigeria and Kenia). UAE launches Blockchain strategy to become paperless by 2020. The state of Delaware, hosting numerous companies from other states and countries, is to introduce a blockchain-based system of company registration, an issue of shares, recording of Board Resolutions, redistribution of shares as a result of purchase and sales transactions (Singaporean Otonomos is developing a similar solution for a number of countries). British Everledger assists banks, insurers and open marketplaces in a reduction of risk and fraud by digitally certifying diamonds, art objects and high-end bottles of wine. Among the fintech sectors, the most interesting are those not related to payments and remittances: trade finance, stock issue, and trade, solutions for effective workflow between banks and their corporate clients. But in reality, main activities account for remittances or the establishment of new banking standards through various associations. Singaporean BAASIS with their DaoPass open API sells client identification service to fintech startups, telecom operators, messengers and e-commerce players from different countries. Two American companies, R3 consortium, and Digital Asset Holdings fight for the right to become “Swift 2.0” for banks all over the world. The first consolidates 70 partner banks (although three main players – Goldman Sachs, Morgan Stanley, and Santander -have recently abandoned consortium), which own 60% of its stock, and it was going to raise $200 million this year but was able to attract only $150 million. The latter raised two rounds of $7,2 million and $60 million. It focuses more on existing blockchain projects buyout – it acquired Elevance Digital Finance in 2016 and Blockstack.io, Bits of Proof and Hyperledger earlier. Ethereum has launched numerous joint initiatives with banks, trying to secure its niche by providing valuable services for traditional market players. In the sphere of remittances some projects (as American Circle, which raised $60 million in 2016 at $428,3 million valuation) put emphasis on provision of services to the end consumers, while others (such as American Ripple, which attracted $55 million, valued at $339 million, and Canadian Blockstream, which also raised additional $55 million) are more focused on the cooperation with partner-banks in order to establish a faster and cheaper remittance infrastructure. Interestingly, Asian investors actively invested in all three companies: Chinese Baidu and CreditEase invested in Circle, Japanese SBI bid money on Ripple, while Hong Kong Horizons Ventures made an investment in Blockstream. First ones are actively growing in the Chinese market; the second has strong positions in Japan and Southeast Asia, whereas the third doesn’t expand actively to other Asian markets.